You are currently browsing the tag archive for the ‘Doctor Faustus’ tag. Who has not battled a fleeting shudder, a secret dread and anxiety upon boarding a Venetian gondola for the first time or after a prolonged absence? That strange conveyance, coming down to us unaltered from the days of the ballads and so distinctively black, black as only coffins can be – it conjures up hush-hush criminal adventures in the rippling night and, even more, death itself: the bier, the obscure obsequies, the final, silent journey. Luchino Visconti’s film of Death in Venice was always a favourite of mine, with its use of Mahler and beautiful Venetian scenes. I never got round to reading source material though, Thomas Mann’s classic novel about artistic frustration and obsession. Now I realize Visconti conflated elements of two of the German writer’s books – Death in Venice and Doctor Faustus – changing the main character’s profession of writer to music composer, presumably as the themes of the novel are more easily translated to film if the subject is music and not literature. Gustav von Aschenbach is a celebrated author who has received commendations from his king, his writing selected as class texts for school children and now in his fifties, enjoys a high level of fame and privilege. One day as he takes an afternoon constitutional through his home town he sees a strange man who catches his quizzical gaze and embarrasses Aschenbach by glaring back at him. Caught up in these feelings of embarrassment and shame, the writer’s calm is thrown off-balance and he is suddenly seized by a desire to travel. His orderly existence is too predictable and tiring, he needs a holiday to refresh himself. Some weeks later he sets off, eventually arriving in Venice in the grip of an unpleasant heatwave. With the city’s canals rising and the humidity pressing upon Aschenbach’s delicate constitution, he decides to leave shortly after checking into his hotel. However, he happens to see a family of Poles dine in the hotel and is amazed by the startling appearance of a fourteen year old boy in the group. While the boy’s three sisters are dressed conservatively and obediently follow their governess, their sibling has long golden hair, wears less formal clothing and seems to be the most spoiled of the children, the constant centre of attention. Aschenbach learns that the boy’s name is Tadzio and begins to find excuses to spend his days down at the beach to watch the his object of obsession at play, even choosing to have his meals at the same time in the hotel. Even as the city’s climate continues to become more oppressive, with officials ordering restrictions that no one seems able, or willing, to explain, the celebrated German author ignores his suspicions, allowing his new obsession to take over. Thomas Mann commented that this story was an effort to discuss the ‘dignity of the artist’, and the current translation by Michael Henry Heim contains an interesting introduction by Michael Cunningham that argues all books are in effect translations, attempts to capture the idea dreamt up by the writer’s mind with the written word. Aschenbach is troubled by the thought that he has become conventional. He enjoys his fame and national renown, but underneath he is aware that it is a poor recognition of his desire to achieve perfection in his art. He is obsessed with abstractions, ideal forms and “particulars”, becoming more divorced from life by his philosophical musings. Mann introduces several odd individuals who are very particular indeed, robbing the author of his philosophical poise. First there is the stranger visiting his home-town, who inspires his sudden feelings of wanderlust. Then there is a fellow passenger on the boat to Venice, an aging dandy, whose face is heavily made-up. Then the cartoonish musician, with the mocking uncontrollable laughter that may in fact parody the effects of the pestilence the Venetian authorities are covering up. I would argue that Tadzio is yet another of this group, a ‘particular’, that Aschenbach’s philosophy cannot reduce to theses or antitheses. His sudden admission of ‘I Love You’, is a complete loss of self-control, a statement that is made with no one else present to witness it. 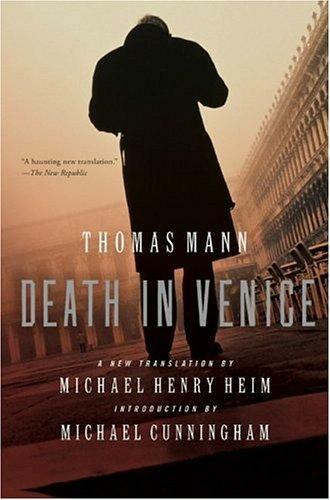 Death in Venice is a book about love, or rather desire. Aschenbach abandons all his hard-won professorial airs and has a barber dye his hair and plaster his face like the dandy on the boat. All to make himself look young enough for Tadzio.